If you're frequently away from home, especially at night, you may be concerned that burglars could be attracted to your unlit house. Let smart lighting take care of that for you with BeON smart lightbulbs that know when you're away from home. The BeON smart light bulb is not a timer system or even an ordinary smart lightbulb that turns on and off according to a preprogrammed schedule. The intelligent BeON smart bulb records your daily, weekly and monthly lighting routine to learn more about your lighting preferences and habits as you use it. Use the BeON app for your smartphone (currently for iOS only, but an Android version is on the way) to automatically turn your house lights on or off right on your usual schedule. The smart lightbulb has more tricks up its sleeve: a backup battery, the ability to listen to sounds and the ability talk to other BeON light bulbs via Bluetooth technology. 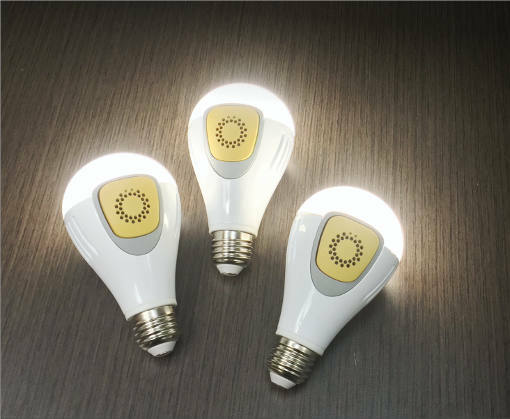 The BeON LED bulb fits into standard light sockets and creates 800 lumens of light (the equivalent of a 60-watt incandescent bulb). A removable module houses its brains and a backup battery that can power the bulb for about 4.5 hours and recharges when you turn on the light — a lifesaver during a power outage. You can even use it as an emergency flashlight. Just unscrew it from the socket and turn it on. The BeON comes with a sound detector that continuously listens to its surroundings. When it hears a specific trigger sound such as the doorbell or the fire alarm, the BeON lightbulb turns on. You can program your BeON lights to turn on in a specific sequence when they hear the doorbell ring, making it appear to anyone outside that someone is actually at home. This can help ward off potential burglars who might ring your doorbell to check if someone is actually home. BeON smart lightbulbs are available at BeON's website. A single bulb costs $75, or get a set of three for $199. Interested in learning about smart locks for your smart home? See our stories about the five best smart locks for your home and read about the August Smart Lock and the Kwikset Kevo Plus lock.